Nintendo Wii Interface Tour Video | OhGizmo! We know a bunch of you are just dying to get your hands on the Wii. Wii understand (yeah, we know it’s an old pun). Until the 19th (you do know it’s coming out Nov. 19, right? ), you can keep yourself happy by looking at as much Wii pr0n as you can fit on an 8 hour day. So, today we present to you Matt C. from IGN showing us how the Wii interface looks and what all options you can mess with. It’s a ten minute video, so get your popcorn. But if you just can’t get enough of this stuff, it should be fun. 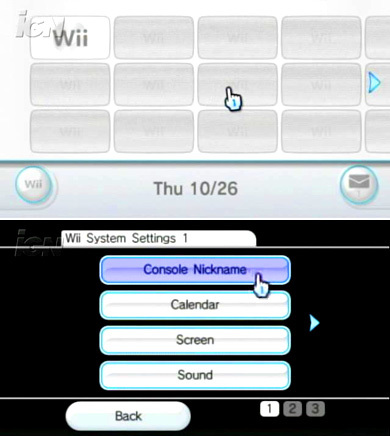 The video above features a guided tour through the Wii’s GUI by IGN’s Matt C.
Various features and options available on the console are presented in extreme detail over the course of the 10 minute video. So get comfortable. Oh man!! I love this comment component thing!! What’s the name? good,but i can't see the vedio you have posted,why?